This holiday season, forget about the snow flakes...instead, go on an adventure in Hotel Transylvania, a new side-scrolling adventure game available on Nintendo DS/3DS game by GameMill Entertainment. Your mission is to save Jonathan, the human, that stumbles into this monster friendly hotel during Mavis' (Dracula's daughter) 118th birthday celebrations. You play as Mavis, collecting gems, completing quests and fighting a few boss battles, in your quest to save Jonathan. As you complete quests, you gain new powers like the power to turn into bat to fly in areas or a ghost to go through areas. These allow you to get into areas to get hidden gems and items. Rated E10+, this game has some mild cartoon violence. The zombie's head rolls off as you kill him. The graphics themselves are of good quality and I quite enjoyed the game's music. Even the monsters were quite cute looking. The game itself is moderately challenging until you get the hang of it. It definitely is geared towards the younger kids, 8+, in my opinion. If your kids are Hotel Transylvania fans, this would be a great accompaniment to their Christmas wish list. I still need to see this movie. The game looks like a lot of fun. My son is obsessed with his DS. 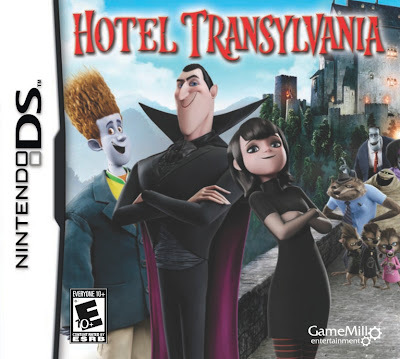 This looks like a cute game...vampires are all the rage now, right? My son wants a DS so badly. It's just not going to happen for a while. But this definitely looks like a great game. I've heard great things about the movie and still would like to see it myself. I'm sure my nephews would enjoy this game.